This is such a gem! I only wish more writing teachers would stress these points. In the college writing center where I work, we often see stressed students who feel they cannot write well. 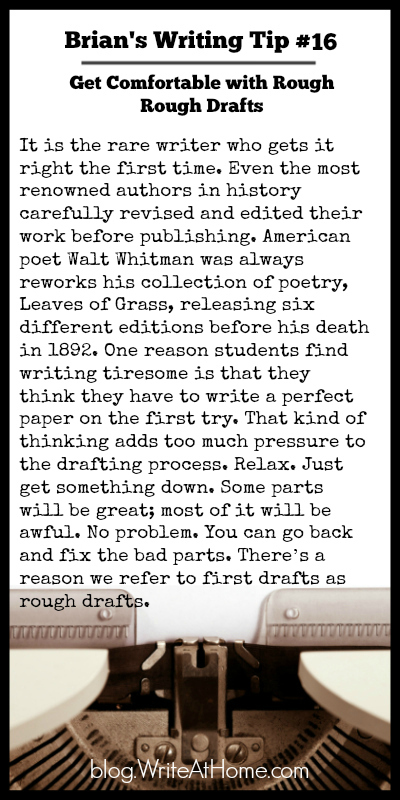 Oftentimes, it is simply a misunderstanding of the necessity of rough ROUGH first drafts! This is a great tip–only in the last year or so did I finally get it through my thick skull. I bogged myself down by editing/writing instead of just writing. Not only did it stifle momentum, but it led to stilted writing–I was treating each typed letter like I was carving it out of stone. Excellent, Tony. Thanks for the comment.